“Persons of Interest” is a new weekly series exploring the lives of students, staff and faculty, both on- and off-campus. 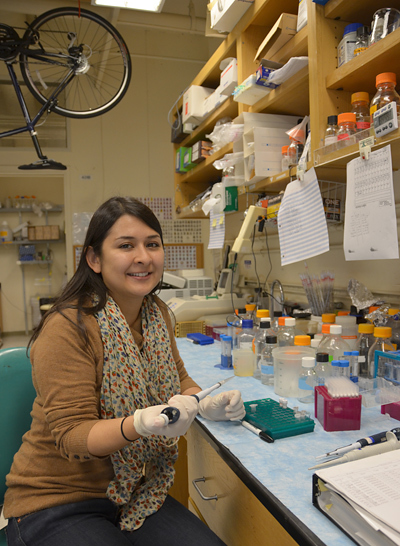 Yet the 30-year-old Mountain View native, whose mother and father hail from Mexico and Peru, respectively, will round out her six-year stint at Berkeley this semester with a Ph.D. in molecular and cell biology. She’s polishing her doctoral thesis, has a journal article undergoing pre-publication peer review, and will begin a multi-year postdoctoral research position in immunology at Stanford in the fall. When Garcia arrived at Berkeley in 2006, she found a campus beginning to reassess its approach to diversity, but lacking any coherent plan or actions — Chancellor Robert Birgeneau had just created the UC system’s first cabinet position on equity and inclusion. In 2007, Garcia co-founded the student-run campus chapter of the Society for Advancement of Chicanos and Native Americans in Science. Juggling the demands of her diversity efforts, Garcia honed her research skills under the tutelage of immunology professor Mark Schlissel — former dean of biological sciences and now provost of Brown University — probing the role of specific micro-RNAs in B-cell development and leukemia. Garcia’s love of science has it origins in the rainforests of deepest Peru, where she studied botany at the university level for several years. She traces her passion for diversity, equity and inclusion to Peru as well. Returning to California, Garcia enrolled at Santa Clara University, where she encountered a role model and mentor, associate professor Angel Islas, who would open a whole new world of academic and career opportunities in science. Islas helped Garcia land her first research position as a lab technician and aided his former student in applying to graduate school. In 2007, Garcia co-founded the Berkeley chapter of SACNAS to support minority students in the sciences. “He has always given me the tools and opportunities to grow and develop — he is my mentor for life,” Garcia says. Looking down the road, Garcia has her eyes firmly fixed on a faculty position at a state university, where she can engage underrepresented communities and pass along her mentor’s gift to her by steering new generations of students toward expanded opportunities. “Promoting the idea of more women and more minorities in science is something I feel is incredibly important for me to bring back to my community,” Garcia says. Know a member of the campus community — staff, student or faculty — who might make a good subject for “Persons of Interest”? Send us a note at news@berkeley.edu. 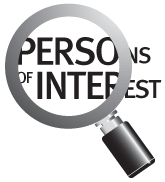 To meet other "Persons of Interest," click above.